Business psychology is a mix of multiple disciplines including Business economics, medicine, linguistics, sociology, biology, anthropology, sociology, and history. Psychology experiments are similar to the other sciences, they are devised to confirm or disprove theories or expectations. In Psychology human behaviour is the raw data and is used as evidence (or an indication) of how the mind works. Though we cannot observe the mind directly we can monitor what we feel, think and determine the patters and links to our behaviour. This is why our behaviour is used as raw data for testing psychological theories on how the mind functions. The word comes from the greek words psyche (spirit / soul) and logia (the study of something). In business Psychology we study how behaviour and the brain impact sustainable performance for both individuals and organisations in the workplace. Studying psychology in a business setting investigates how to make people and organisations more effective. Through the use of social scientific research methods to study people, workplaces and organisations we can better align their multiple (and sometimes competing) needs. The goal of studying psychology in a business setting is to create healthy and productive relationships between people and organisations for mutual benefit. 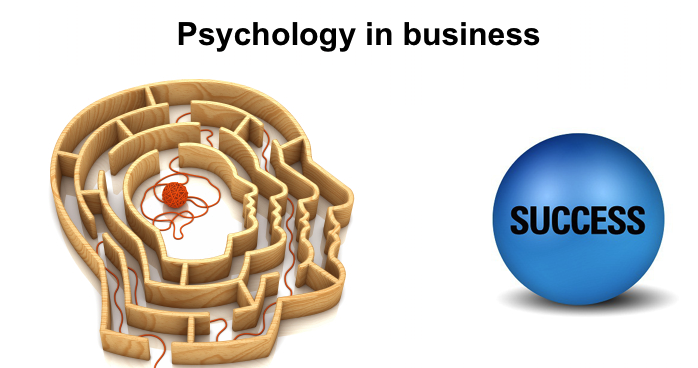 The study of Psychology in business is not about telling business what to do but a reciprocal relationship which draws insights from those with experience of what works in the workplace, and sharing new finding which can shape new behaviours and practices. This enables psychological research to be applied and tested in practical ways and to gain credible data to advance theories and practices. Typical data collection methods include questionnaires, surveys, focus groups, interviews and case studies. this data is then analysed via a variety of analytical techniques including descriptive and inferential statistics, thematic and content analysis. Advise – Consultants can give advice on a wide range of people and behavioural issues in the workplace. these range from career guidance to how to drive a large scale organisational change. Analyse – Consultants can help organisations to understand issues (such as high staff turnover and low engagement) and challenges facing employees in a high pressure environment. Design and Deliver solutions – Consultants can design, deliver and test the effectiveness of solutions to these challenges. E.g. The design of a psychometric tool to help select better employees or assess Emotional Intelligence levels required for management success. Test – The Consultant can then measure the effectiveness of interventions.